Can't attend? Follow LABBURLESQUE_JP to know of future events! 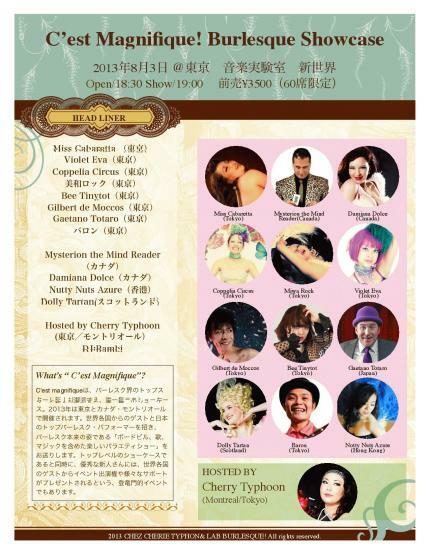 C'est magnifique is a very unique showcase, including the variety diversity of 'Burlesque'. From young bee to well-oiled stage person, from east to west...this showcase includes all that burlesque, such as dance, song, vaudeville, sketch-comedy, magic, and so on! This special showcase is also a place to search the new stars of burlesque. The guest judges will encourage the young star, by giving the wisdom, tips, or the opportunity for performance! ...And Future Stars of burlesque!!! !